Three days of Robogames were in San Francisco’s Fort Mason this weekend. My interest was in autonomous sumo robot competition. 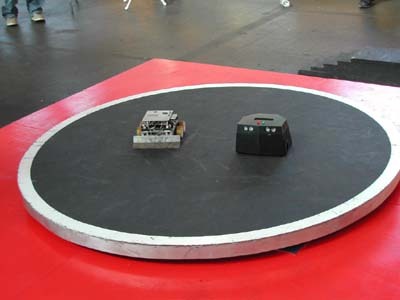 Robot sumo is played on round black steel plate. Edges are marked white so robots can detect boundaries. The goal is to make a robot that would detect the opponent and push him out of the ring. Robots are autonomous so there is no radio control. There are several categories : 25g nano, 100g micro, 500g mini, 3kg, LEGO ..etc. In both 500g and 3kg categories, Singapore’s Ngee Ann Polytechnic won all first three places. What I could see, for all their design they used Microchip dsPIC microcontrollers and 10-20 Sharp infrarred proximity sensors pointing in all directions. They also used, what I didn’t know was legal, magnets underneath their robots to increase traction. They were fast and pushed their oponents from the rink with ease.